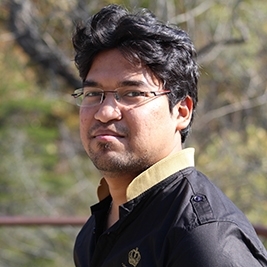 I am Kuntal, an engineer with professional experience in an IT industry of 4.5 years as a Software Engineer. I am an international graduate student pursuing my masters in Data Science offered by the Department of Informatics and Computing in Indiana University, Bloomington. I have 4.5 years work experience in programming/coding and project management in a reputed Indian IT firm (Cognizant Technology Solutions). I have professional working experience in C and Python programming and in databases where I have worked in T-SQL working with SQL Server, MySQL, Access extensively doing data analysis and data management. I have been assigned in roles of developer as well as of a tester where I performed tasks in every stage of software development from initial design to aftercare. Everything now-a-days is data driven and soon this data will reach such a proportion that it will not be able to manage it if not analysed, stored and mined properly. I was motivated seeing what fantastic work we can do using data and how mining, classifying and analysis innovatively can extract useful information. This I think is the need of the hour and this only got be interested to do masters in data science. During these 3 semesters of graduate study in Data Science, I have done some fascinating and challenging projects in Data Mining, Database Design, Sentiment Analysis, Machine Learning and have knowledge in algorithms, statistics, machine learning, data mining, web designing etc. I am also the Lead Associate Instructor of an undergraduate course which mainly deals with databases, PHP, data representation etc. I have also worked as a Geo-Spatial Data Analyst for Indiana Geological Survey where I created and worked in databases extensively. In my short professional career of 4.5 years in Cognizant Technology Solutions I worked for international clients ING IM and Citi Bank. I have been awarded “The Rising Star” in 2013 and was also an active member of the “Best Project” team in 2011. I was also rated an “Exceeds All Expectations” employee of the company in 2014. I am really excited to work in this position and be able to learn and perform some exciting tasks which will enable me to achieve new professional heights. I guarantee that I will try my best and give my full efforts to provide optimal solutions for your problems. To schedule an appointment, pleaseemail kmaiti@indiana.edu or kuntal.maiti@gmail.com.